Pretty soon chats in Outlook.com are going to be all Skype, all the time. 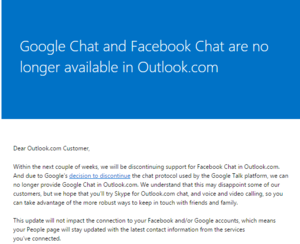 Microsoft is pulling the plug on Google Talk and Facebook chat in Outlook.com. The company recently sent out email notifications to Outlook.com users to let them know about the change. Google started moving away from Google Talk in favor of Hangouts in May 2013—ironically the same month that Microsoft added Google Talk to Outlook.com. Unlike Talk, which uses the open XMPP protocol, Hangouts is proprietary and unavailable to multi-chat clients. However, Google has continued to support Talk and has yet to announce when it might shut down the XMPP-based service. Facebook is also discontinuing its use of XMPP. Microsoft added Skype integration to Outlook.com in August 2013. 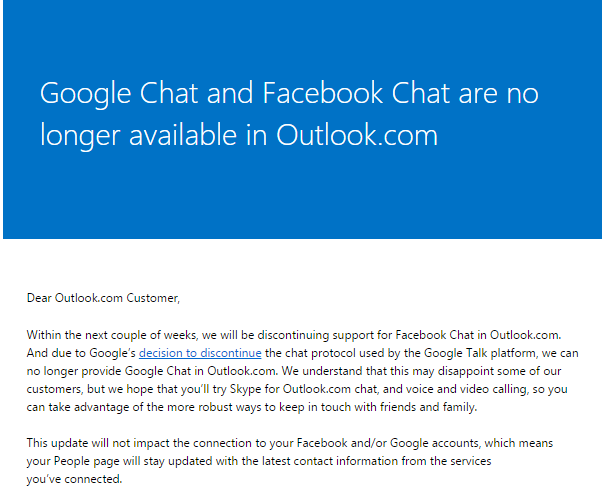 Microsoft’s email to Outlook.com users about the end of Google Talk and Facebook chat integration. The impact on you at home: Microsoft says the end of Google Talk and Facebook chat in Outlook.com will happen “within the next couple of weeks.” The end of third-party chat will not impact Microsoft’s People apps online, or in Windows 8.1 and Windows Phone. Microsoft allows users to integrate Facebook and Google accounts (among others) to add social updates and contact information from other services to your Microsoft contacts list. To compensate for the end of Facebook and Google integration, Microsoft is encouraging users to switch to Skype. It’s hard to imagine anyone who is using Outlook.com wouldn’t also be a big Skype user. But users may have some contacts who are on Google Talk or Facebook and don’t use Skype. For Microsoft, dumping Facebook and Google also highlights how valuable Skype integration is with Outlook.com. Not only can use the platform to send text chats, but also voice and video calls. That’s an important feature given that competitors, like Google’s Hangouts platform integrated into Gmail and Google Talk before it, offer similar features.